Edward Gettys Jr. took home the big bucks during the Toyota Tundra Bassmaster Weekend Series, operated by American Bass Anglers, Tennessee East Division 4 opener, held March 17, 2012, on Lake Guntersville.Running out of the Waterfront Tackle & Grill? landing in Scottsboro, Ala., the hometown angler caught five bass going 21.29 pounds. He anchored his catch with a 6.63-pounder that took the top bass title in the Boater Division. For the win, Gettys earned $2,702 with a $315 bonus for the lunker. ?I caught my second biggest bass and another fish on a chatterbait early in the morning,? Gettys explained. ?I caught a couple more on a lizard including the biggest one and one deep on an Alabama rig. All the other fish were shallow. I fished the mid-lake area about 10 miles from the landing. ?In second for the boaters, Tim Hurst of Oxford, Ala., landed a five-bass tournament limit weighing 20.39 pounds. He pocketed $1,351. ?We ran all over the place,? Hurst said. ?I caught my fish shallow on a jig. I caught the five biggest ones off a shell bed. 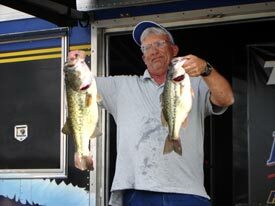 ?Gregg N. Crass of Oliver Springs, Tenn., took third among the boaters with five bass at 20.15 pounds. He capped his catch with a 4.52-pound kicker to win $901. ?I caught my fish on a green pumpkin jig around milfoil,? Crass said. ?We ran about 15 minutes down the lake. I broke off two good fish that would have made a difference. ?Ted R. Ridley of Maryville, Tenn., finished fourth with five bass and 18.68 pounds including a 5.86-pound kicker. Shawn M. Thornburg of Valparaiso, Ind., landed five keepers for 17.85 pounds and fifth place. His biggest bass weighed 6.21 pounds.In the Co-Angler Division, Eric Cabrera of Chattanooga, Tenn., brought in three keepers at 11.37 pounds. He anchored his bag with a 4.59-pounder to earn $1,351. ?I was throwing several different swimbaits,? Cabrera revealed. ?I probably caught about 20 bass. We fished the mid-lake area. ?In second for the co-anglers, James E. Mullins of Morristown, Tenn., landed a three-bass division limit for 11.03 pounds. His biggest bass weighed 4.44 pounds. ?I caught my fish on an Alabama rig, a Rattling Rap and a soft hollow belly swimbait,? Mullins said. ?We fished close to the landing. I didn?t lose any big bass, but my boater lost a 7-pounder at the boat. ?Brandon R. Gaylor of Oliver Springs, Tenn., took third place among the co-anglers with two bass weighing 10.97 pounds. He upped his average with a 6.97-pound bucketmouth that took tournament big bass honors. For third place, Gaylor collected $450 with an additional $158 for the big bass. ?I caught the big one at about 9 a.m. on a Red Eye Shad,? Gaylor said. ?I was fishing about 10 minutes from the landing. ?Clint D. Harrison of Georgetown, Tenn., finished in fourth place with three bass at 10.55 pounds. Paul E. Palmer of Madisonville, Tenn., rounded out the top five co-anglers with three bass for 9.93 pounds.For more information on this tournament, call Billy Benedetti at (256) 230-5632 or ABA at (888) 203-6222. On line, seewww.americanbassanglers.com.